Will Weldon in action for Phantoms against Swindon. Forward Will Weldon insists Phantoms must hit the English Premier League play-offs with maximum momentum. Six of the city club’s nine remaining regular-season games are on home ice as they continue to battle for a top-four finishing position. The first of those comes on Sunday when they entertain Swindon Wildcats (5.30pm) at Planet Ice. Weldon stressed: “It is absolutely vital we reach the play-offs in good form. “We have known for a long time we will be involved in them, but we cannot just cruise there. “We are all focused on finishing well and hopefully we will gradually get the injured guys back as well. “Once that happens we can hopefully take our performances on to a whole new level. “But the first aim is to dust ourselves down after not picking up any points last weekend and get going again. “Having just one game should play into our favour with our injury problems. We can focus all our energies on facing Swindon and hopefully come out of it with league points. Weldon cut a furious figure last Sunday night after his ejection in the 5-2 defeat against Basingstoke. 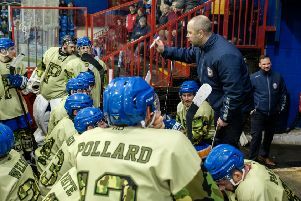 He was thrown out in the closing seconds of the second period for a check to the head – an offence he refuted with video evidence appearing to back up his stance. Weldon added: “I was looking to make a hit on the Basingstoke defenceman and take the puck. “I thought I caught him fairly and those who saw the video confirmed that as I hit his shoulder, not his head. “It wasn’t a great call and not one made by the official initially, but it was a shame to be given a game penalty when we were already so short-staffed.